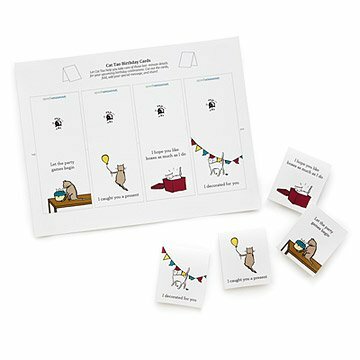 Wish your favorite friends and family (furry or otherwise) a happy birthday with these free downloadable cards, featuring an array of cat-isms. To use, simply print, fold, and get celebrating. Click here for your free download of the Printable Cat Tao Birthday Cards. Check out our Cat Tao glasses and pillows! PDFs formatted for 8.5" x 11" paper. Includes 4 unique cards on one sheet. Unique sense of humor that should be shared with the world. KEEP GOING!